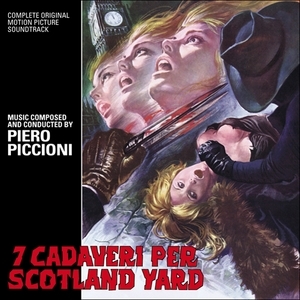 The 299th Soundtrack of the Week is 7 cadaveri per Scotland Yard (7 Murders for Scotland Yard), music by Piero Piccioni. There are basically just a few themes or moods that repeat. There's a Morricone-like dissonant horror thing, for one. Then there's one that's like a Goblin and/or Peter Thomas remix of Lalo Schifrin's music for Mission: Impossible. That gets the most of a work out. You hear it on almost every track. Fuzz guitar and percussion, some moments that are like electric Miles, some great organ and keyboard playing, some lyrical moments; all play their part. Good record if a bit repetitive.